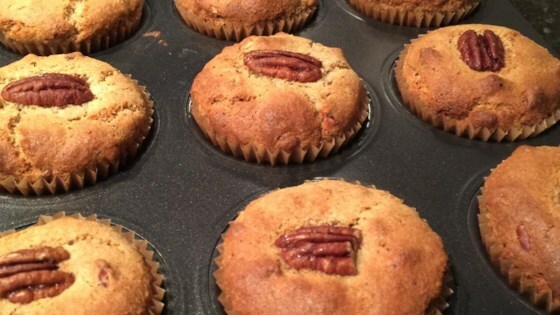 "A super moist, easy, and healthy muffin recipe that will satisfy all ages and especially those with allergies or lifestyles that are gluten-free, dairy-free, or vegan." Preheat oven to 350 degrees F (175 degrees C). Grease 9 muffin cups or line with paper liners. Stir water and flax seed meal together in a bowl; set aside until "flax egg" is thickened, about 10 minutes. Whisk gluten-free all-purpose flour, pecans, coconut flour, baking soda, baking powder, and salt together in a large bowl. Add flax egg, maple syrup, coconut oil, and vanilla extract to flour mixture and mix well until batter is smooth. Scoop batter into the prepared muffin cups. Bake in the preheated oven until muffin tops are starting to brown, about 17 minutes. Cool muffins in the tin for a few minutes before removing. Gluten-free all-purpose mix can be from a packaged mix, or you can use my suggestion of 1 1/2 cup oat flour from milled oats, 1/2 cup white rice flour, 1/2 cup brown rice flour, 1/2 cup tapioca starch, and 2 teaspoons xanthan gum (or omit if you have none on hand). Mix well and scoop out amount needed for recipe. Almond flour can be used in place of the gluten-free all-purpose flour, if desired. The taste was good, but mine did not rise at all. Did not look like the pic in the least. I followed the directions completely. What did I do wrong? These muffins are DELICIOUS!! They're easy to make and the taste is amazing!